reaching up (bleeding heart), originally uploaded by jahansell. Since my epimedium was popular, here's another garden picture. (The Sharon Classic is on Saturday so no worries, I'll be back to the big picture soon!) But aren't these bleeding heart fronds wonderful? Like hands reaching for the sky - it's like a dance piece! I love these fronds-- the bleeding hearts in my backyard are in full bloom, the ones in front are just reaching up, like these. It shows that plants are always fascinating to look at, in all stages really. 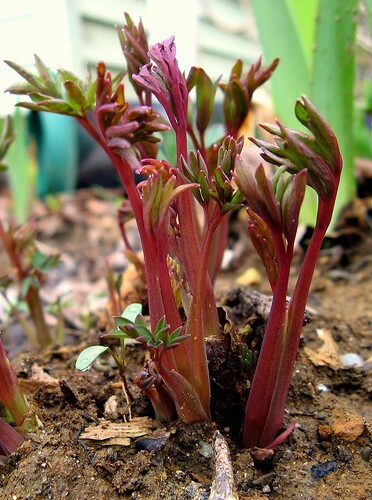 What a fabulous photo of these emerging shoots. They do look like hands! Did you see the photo of blooming ones in Zürich on AinZ's blog? Thank you for your work in putting together the polling site on the forum for Theme Day.